Michel Camilo has composed scores for films all over the world, arranged and composed for the Danish Radio Big Band and has appeared as a soloist in just about every top national symphony orchestra and philharmonic throughout the globe. What: Michel Camilo Trio, with Cliff Almond and Lincoln Goines, final Vail Jazz Club Series performance. When: Wednesday, July 27; doors open at 8 p.m. and music starts at 9 p.m.
Where: Mountain Plaza Lounge near base of Gondola One. More information: The trio also will perform at Vail Jazz @ Vail Square from 6 to 8 p.m. Thursday, July 28, at the all-weather jazz tent in Lionshead. Advanced tickets for that show are $20 for general admission or $40 for premium seating. For tickets or more information, visit vailjazz.org or call 888-VAIL-JAM. 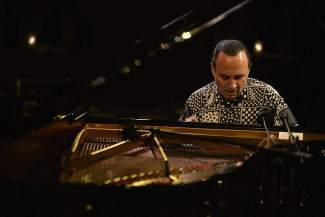 VAIL — Michel Camilo has never wanted to limit himself to a specific genre of music. His freedom of expression is characterized by a flurry of rubber wrists and fingers slapping the piano keys. He is a blur but strikes every note with incredible intent and accuracy. In spite of his precision, there is something about his demeanor not unlike a child playing with a favorite toy. With no barriers in mind, Camilo moved to New York City in 1979 and studied at The Julliard School and Mannes College. Shortly after making his international stage debut in 1983, Camilo won his first Latin Grammy. He formed a trio and, after an inaugural Carnegie Hall performance, launched into a European tour. More than 20 albums later, Camilo is still touring the world, jumping back and forth from Europe to the Caribbean, to the United States and South America in any given month. He has composed scores for films all around the world, arranged and composed for the Danish Radio Big Band and has appeared as a soloist in just about every top national symphony orchestra and philharmonic throughout the globe, including the National Symphony Orchestra, the Carnegie Hall Big Band, the Cleveland Orchestra, Copenhagen Philharmonic and the BBC Symphony Orchestra. Back in his mother country, Camilo has reached national hero status, being named a Knight of the Heraldic Order of Christopher Columbus and awarded the Silver Cross of the Order of Duarte, Sanchez & Mella. Conducting for the National Symphony Orchestra of the Dominican Republic, one of his programs included “The Goodwill Games Theme,” which went on to win an Emmy Award. For several years, he was the musical director for the Dominican Republic’s Heineken Jazz Festival, and his recordings have consistently topped national radio play charts. In addition to many appearances now at Carnegie Hall and the Kennedy Center in New York, Camilo has also performed at the White House and Royal Albert Hall. He has shared the stage with nearly every global jazz icon of our time, including Dizzy Gillespie, Herbie Hancock, Tito Puente, Paquito D’Rivera, the Labeque sisters, Bela Fleck and Toots Thielemans. Camilo’s style continues to defy definition, seamlessly bridging gaps between popular and world music, jazz and classical. After a Grammy-award win and numerous Latin Grammys, the pianist continues not only to enrapture world audiences with his magical command of the keys but imparts his wisdom and passion to students across the globe. “Never let anyone tell you that you cannot do this, you cannot do that. I never take no for an answer. I always see a new challenge, an opportunity to grow, to develop and open your eyes and ears,” Camilo recently told a Master Class at the London Centre of Contemporary Music.